Blog > Issues > Property Rights > California bureaucrats levied a $4+ million fine against these homeowners. Now they’re fighting for their rights. California bureaucrats levied a $4+ million fine against these homeowners. Now they’re fighting for their rights. When it comes to government bureaucrats abusing citizens’ property rights and pushing the envelope on constitutional limits, the California Coastal Commission is in a class by itself. Our latest effort to defend a pair of Southern California homeowners against the commission’s overly aggressive and heavy-handed tactics is a case study in government abuse of property rights. Today, we filed our opening brief on appeal in Lent v. California Coastal Commission. 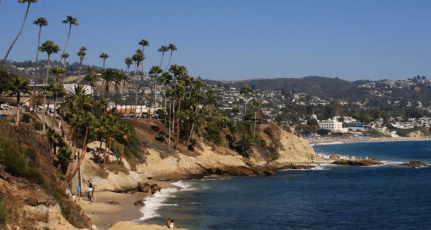 We are challenging the California Coastal Commission’s $4.185 million penalty against Warren and Henny Lent, who own a home in Malibu along the Pacific Coast Highway. In 2016, the commission issued a unilateral penalty order against the Lents, to punish them for having retained a fence, gate, stairway, and other innocuous features of a typical family home, in a five-foot-wide public access way. These features were in place when the Lents purchased the home in 2002. There was no indication in the title records that they were unpermitted or otherwise illegal. Moreover, the “access way” has never been and is not currently open to the public: the relevant easement agencies would need to make substantial improvements before pedestrians could safely use the access way. That is because, from the street down to the beach, there is a 20-foot drop, partially interrupted by a massive storm drain owned by the county. The precipitous drop is no doubt one reason why prior owners installed the fence and gate. But no matter, the commission concluded—everything had to come out. If you’re familiar with the Coastal Commission’s customary treatment of property owners, you won’t be surprised that the Lents’ hearing was far from fair. The lack of procedural safeguards, coupled with the commission’s bias in favor of maximizing public access to the coast over respecting private property rights, meant the hearing would be a constitutional sham. Our challenge to the commission’s penalty order highlights these defects. First, we contend that Public Resources Code section 30821 violates property owners’ right to due process. This 2014 amendment to the Coastal Act dispensed the commission from having to go to a neutral court of law before levying penalties on hapless property owners. Section 30821 is constitutionally infirm because it requires the commission to use only the lax standards and rules of procedure and evidence that are typically employed in run-of-the-mill land use hearings. But an administrative proceeding that can result in a multimillion-dollar penalty is no normal land-use hearing. In effect, section 30821 creates a quasi-criminal enforcement action. With such high stakes, the perfunctory procedures that land-use agencies typically employ—no right to testimony under oath, no right to cross-examine witnesses, no right to discovery, no right to subpoena—are insufficient to satisfy the due process rights of people like the Lents who become targets of the commission’s zeal. Second, we argue that section 30821 must fall because it converts the commission into an unconstitutionally biased adjudicator. The statute gives the commission the power to fine, and it directs all fine revenue to be deposited into the Violation Remediation Account, which is designed to further the Coastal Act’s goals, in particular maximizing public access. In other words, section 30821 gives the commission the power to penalize landowners and then to use the profits to advance the agency’s own pet projects. It’s like a form of regulatory bounty hunting. While the remediation account funds are ostensibly controlled by a separate agency, that control is only pro forma. In reality, the commission decides where the fine revenue goes. Third, we contend the Lents’ $4.185 million penalty violates federal and state prohibitions against excessive or arbitrary fines. The Lents were fined not for anything they had done, but simply because they in good faith allowed pre-existing, normal residential fixtures to remain in place. Far from hurting the public health or welfare, the Lents actually furthered those interests by keeping in place a fence and gate that helped to prevent pedestrians from falling seven feet or more from the sidewalk down the unopened public access way. The Lents even gave the commission a set of keys to the gate, to assist in the development of the access way. The gross disproportion between the multimillion-dollar fine and the alleged “harm” supposedly justifying the fine renders the penalty order unconstitutional. Briefing in the California court of appeal is expected to continue till the summer, after which we hope for a hearing sometime next year. We’re optimistic that the Lents will ultimately be relieved of this heavy and unfair penalty—and hopeful that the California Coastal Commission will evolve toward a more balanced approach to environmental protection and public access that doesn’t require abusing private property owners’ rights.